From the Warp: Deathwing: From Black to Bone? Deathwing: From Black to Bone? Starting my Deathwing army has given me the opportunity to do some research as to when they actually changed from black armour to the bone color we all know them as having. While this may not be of much interest to non-Dark Angels players, it was interesting to try and piece together a history for these guys with the little information available out there. With the opportunity to rebuild my Deathwing now that I have sold my previous one and currently have no army, I decided I would do a little research into them. 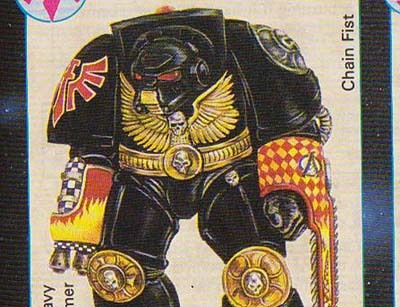 I wanted to know when the Dark Angels first company changed from Black to White (or bone colored) armour. Why? Two reasons. First, I wasn't really sure when it happened and second, because I was contemplating building an earlier time period force and wanted to get the colors and armour types accurate. I started with the story of Two Heads Talking. This was published in the Deathwing expansion for the first edition of Space Hulk. Without going over the whole story in detail, it talks about a group of Dark Angel terminators who go to their recruitment world only to find it infested by Genestealers. They set about cleansing it and succeed. Two Heads Talking is the name of the Librarian who kills the Genestealer Patriarch. As a ceremonial gesture, they decide to paint their armour white (the color of death) prior to undertaking the task. This was done in remembrance of their tribal ancestors who painted their bodies the funeral color white prior to going out to seek vengeance against a rival tribe for killing a small child and they did not expect to return due to the overwhelming odds they would be facing. But when did this happen is the real question. They don't give a date in the story, but do give enough other information so that if you put that story in context with everything else out there, you can figure about out when it happened. As best I can figure, it happens sometime during or after M36. But reading the story, we learn a couple of things. The term "Deathwing" was not used to describe the Dark Angels 1st company before this point. It was simply the name of the drop ship they used to get to the planet. It was large enough to hold around 30 terminators so that makes it bigger than Thunderhawk transport I believe. What size ship exactly, I don't know. Before this point, I believe the 1st company was simply known as the first company like every other Chapter. They had not adopted the name "Deathwing" for themselves just yet. We also know they still wore the black armour at the time of this event. As an additional note, the broken sword was not their "icon" either. They still had the complete sword as all the other members in the chapter had. Their's was painted red instead of white though. So I'm left with a decision. Do I paint them the bone color or do I go with black? Painting them black would date them sometime before M36 but after the Heresy. Before the adoption of the broken sword as their icon and the bone colored armour. They would be the original tough guys. Lots of people have the bone colored version and they are instantly recognized for who they are as well. Remember that painting quiz I gave you all a while ago? The bone/white would give me a chance to do some great work with some subtle shading and such, but black would be an even harder challenge I think. The models would really be carried by the details. So let's hear it folks, what do you think would look "better" on the table, the classic bone color or the rarely seen black version? I'm not sure the Two Heads Talking story is fact, even in the 40k-verse. If I remember correctly, the stories are told to members of the chapter as 'lies to children' - illustrating a point without giving away the whole truth, and as Angels move up through the chapter, they are told different versions of the same truth. However, having said that... my own CSM army (Fallen) has black terminator armour, and they look very good, recognisable, and they do start a conversation. I would vote for the black armor, it makes them appear more sinister and your army won't look like every other Deathwing force out there. Colin: I knew they told their history to recruits as they progress through the ranks, but I figured the way this one was written (as though the participants themselves were telling it) made it a bit more official. Dan: In the story there are no dreadnoughts or land raiders, so I'd have trouble making my force fit with the background. Susan: That's where I'm leaning, but I need to figure out how I'm going to paint them. Skip the black, go the bone. Every damn army in the 40k universe is painted black. It's easy to do and doesn't grab the eye on the tabletop. Do the bone and add in the checks and symbology you want to. 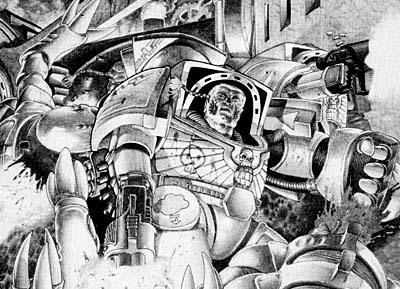 Just say that the Terminators in this particular squad are the originals from the old DA 1st Company. Or perhaps use the markings to deliniate sergeants, captains, etc. The grizzled old veterans of 1st company still leading the Deathwing? Another thought - you could also make the squad leaders, or perhaps one entire squad black to symbolize their age and affiliation with the original DA 1st company? Bone, if you predate your army the vehicles and dreads and new terminator armor won't make sense. I think black is preheresy, at least the unbroken sword is. Also, the way you paint, the bone will give you a better foundation for shading, weathering and detail. If you want to paint black, build some Ravenwing for a multi-wing force. Black with Dark Angels Green highlights. Old School DA colours, with nice fancy new plastics. I recently saw a Deathwing army entirely composed of new plastic terminators but painted with colours and marking straight out of Second ed. I can vouch that they looked amazing. The core difference in the black was it was highlighted using a wet blended Payne's Grey technique that really contrasted with the Bright Second Ed. markings. The army included some Forgeworld Mk IV Dreadnaughts (which could now be easily replaced with Plastic Ven. Dreads with Mk IV FW Arms), and two Mk IIB Land Raiders that had the track links swapped for scratch built ones that looked like the old roller style ones. additionally they had modified the top panels so that the tracks were exposed all the way along the top. Black was their color when they were still Native American inspired. Now they're Semitic inspired. Depends on which fluff you prefer for their names and such, old school or current Grimdark school. I love the traditional Dark Angels scheme, but the black would be great and stand out well as an element of your army. It would also be unique. Having said that, I really want to warn you off the red/yellow checkered think that's going on in that picture. Maybe they did that before people figured out that golden truth of modern design: Less is more. I like the idea of the black models, but as soon as you throw the red and yellow in there, it looks really NASCAR. And that's never good. How about a bit of middle ground to through into the mix. I remember an image where there was terminators marking each others armour after the battle your referring to. So how about go for a black base but then use some bone as a tribal markings of sorts so then you can individualise each of the figures but keeping them uniform at the same time. It also will give you the chance to give different squad markings as well when you take it from a tribal background. But then I've always been a fan of the American Indian background of the Dark Angels to any other. I'm with John from Santa Cruz. Black is cool, old-school, and flavorful, but it's pre-heresy. If you want to make a by-the-fluff sort of force, only go with black if you're going for a pre-heresy look for your models (which means a fair amount of conversions). If, however, you want to newer looking terminators, bone seems the logical choice. I'm jaded though, because I think the bone termies look great. Bone is "current" while black represents the past. Although there are a lot of "black" painted armies, most of them are "current". I feel the black will lend itself to more conversations. Since the broken sword represents the physical breaking of Johnsons' sword(now carried by Cypher), as well as the symbolic breaking of the chapter at the end of the Heresy, why not black with the broken sword? This way they are pre-bone colored, yet post heresy. Black with solid sword. You could use them as pre-heresy and/or Fallen. I vote for black too... and who says you can't have dreadnoughts? There's one on the cover of the Horus Heresy novel "Fallen Angels" and in the seventh chapter of that book they fight to free Brother Titus, a first company dreadnaught, from a crashed drop pod. I realize this was post-heresy in terms of time frames (200th year of the great crusade, but pre-Isstvan V), but I think it could still work for you design and play style. in "Fallen Angels", Nemiel goes on to describe Titus as "a hulking hunchback giant with a matte black ceramite hide. Both shoulders bore the winged sword emblem of the First Legion" and his right arm was a standard assault cannon and a four-fingered power fist for the left. Interestingly enough, there's no mention of Terminator Armor clad marines in either of the Dark Angels-focused Horus Heresy books... although I do recall them mentioning new Mark-IV armor being manufactured in the forges of Caliban. As a historical note, the broken sword emblem comes about as it was Captain Gabriel Broken Knife's heraldry(he's the guy who Ezekiel Cloud Runner talks to at the end). As he is the Captain of Deathwing in the Hulk expansion's missions it appeared on other terminators in the art, mostly in the mission book and painted figures. History aside, I painted my Deathwing termies ashen grey as a compromise of sorts, indicating the armour is still black, but they perform the rite of Deathwing each time they go to battle. I would go with black. Bone is cool and all, but I think the black would be a nice change. I would like to answer your question with one of my own your army will be in what mark of armor? If you use the pre-heresy armor conversions then you would need the M-29 colors if your using contemporary M-40 miniatures then you would want the bone, if your using (or converting to) the M-33 armor then I say black and green. Thanks folks, I appreciate the opinions. It's my understanding that their armour was black and their icon an unbroken sword up until the home world cleansing (around or after M36). The bone color and the broken sword come from that event according to the info I have. Now I have heard the broken sword is for other reasons, but I've never found anything saying it was from the fall of Caliban, that time period, etc. like some folks say it is. The Space Hulk Deathwing supplement explains the reason behind the broken sword and their 1st company standard (the angel, the mountain, lightning bolt). That being said. I'm going with a later MKIIIC termie armour so that puts me post heresy for sure. I was thinking about making them sometime in M34 or M35... that would put them using the newer marks of termie armour and still be painted in black with the unbroken sword icon. Black and red is going to look like "the Black Widows chapter". Black just looks too dark and doesn't look as good as bone on the table. Unless you buy loots of OOP stuff (which looks cartoony) or go crazy on the conversions, you will not have continuity with dating of the Terminator armor, Land Raiders and Dreads. Resist the darkside, (or you could just play Templars). Oh yeah, and black will not have as high of a resale value, when it comes time to sell them. Hudson: I know, I know. Gothmog: I wish I could find a "timeline" of termie armour. I know there is one out there for power armour, but I've never found one for termie. It would help me "date" the force. SC John: Resale?!?... that hurt. Have you thought of changing it to a successor chapter? That might open more options for you. I know you already said you are painting them black, but another thought here is if Dark Angels do ever get a new codex the newer colors will surely fit in with whatever crazy new unit you guys get. Gray Knights may be around the corner, but the next set of rumors are still wide open and if GW keeps up with the Imperium/Xenos back and forth that leaves only a few remaining options. I know whatever you do will turn out amazing so I am simply looking forward to the result. Have you had the chance to read Deathwing the novel? - think it can be printed on demand via the black library. The Deathwing story is probably my second favourite piece of old 40k fiction (behind the Horus Heresy story printed in WH161). Maybe painting the squads in Black but making your Captain 'Broken Knife' Gabriel. (pre Homeworld cleansing). It could be a cool centrepiece. Lord Shaper: I have, but I keep coming back to Dark Angels. Nobody matches their background. giles: I did not know it was a novel. I thought it was a collection of stories about different 40k factions. MCT: Now there's an idea. Sorry, couldn't resist the tweak. Actually, I'm looking forward to seeing how you'd approach black now as opposed to how you did your templars. Hudson: I tried something the other night. I don't know how I feel about the final result. It has some promise to it, but it needs some refining in my technique. I'll post pics of the white and black for comparison in the coming week or so. The black is definitely much harder to do. Jorge: You're correct. The actual name "Deathwing" was the name of the transport ship they flew in when all of this originally happened many moons before.